Dream of 100 Nations was the first album to draw together the fickle threads of dance and world music without turning it into a noose in the process. 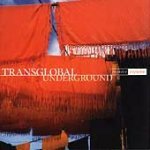 Five years and a Deep Forest later things don't look quite so good for Transglobal Underground. Their very strength, the diversity of their members seems to have resulted in a patchy and incoherent album. "Rejoice Rejoice" stumbles from the inane to the embarrassing. Only the closing track "Air Giant" conveys what they were once capable of, the beats, bigger than any Big Beat have to offer, pour down on the most fragile of strings. Elsewhere however, raps about Disco Dancing Egyptians and private jokes fill the space where the tunes used to live. Without the pain-killing beats and the often inspired instrumental backdrops the lyrics are left exposed to our ridicule. Only Natacha Atlas's vocal escapes this trap, and that's only because she's singing in a different language. Reject, Reject.